Our current level of technological prowess is severely hindering efforts to explore the solar system. Nine months to get to Mars—who's got that kind of time? 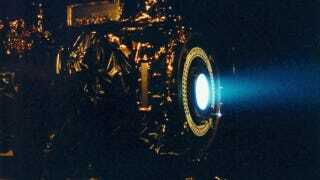 If a new breed of ion thruster currently under development at the Australian National University is successful, we'll get to the Red Planet in a third of the time. The drive is known as a Helicon Double Layer Thruster (HDLT) and is being developed with a $3.1 million (AU) grant from the Department of Industry, Innovation, Science, Research and Tertiary Education. The SP3 Laboratory at Australia's National University (ANU) is collaborating with European firm EADS-Astrium and the Surrey Space Center on the engine design. The ANU is currently building a testing facility at the the Mount Stromolo observatory to put the HDLT through its paces once complete. "A number of Australian universities teach aerospace and mechantronics. Up until now, there's been nowhere for them to test their spacecrafts – they have to go overseas," explained chief researcher Professor Rod Boswell. "So this will really be providing a major service, not only in Australia, but also in Southeast Asia." But what exactly is an HDLT? This double layer can be thought of as a thin standing shock wave across which there exists a strong electric field gradient. It is this electric field that accelerates ions from the source plasma to very high exhaust velocities creating thrust. Because the double layer is purely the result of plasma density, system and magnetic field geometry, no accelerating grids are required. Also, because there is equal flux of electrons and positive ions from the thruster there is no need for a neutraliser. It is in this sense that the HDLT is a "true" plasma thruster as it ejects equal numbers of both positive ions and negative electrons. This design is also quite helpful in that it accepts a wide variety of fuel sources, not just super-expensive noble gases like xenon. According to Boswell, "There are no moving parts or grids – this design is just a cylinder. All the important parts that contact the propellant are either glass or ceramic." That flexibility means means "we can use any type of propellant, including piss," he told the Register. "In the International Space Station, there's a system that extracts water from urine, known as the ‘Russian piss-presser'. The result ends up with a pH around one – we could easily use that. Xenon is expensive – why not use what's already there?" Its eloquent design also translates into significant fuel savings. Since power is only used to initially create the plasma and maintain the electric field, the HDLT barely sips fuel. According to the ANU, "The 0.5sccm of feed gas represents a mass consumption of 160 mg/hr, so that a typical 5 hour burn would use 0.8g of propellant." That's a huge savings over current-gen chemical thrusters, which account for a vast majority of modern spacecraft weight, and can even be theoretically powered by on-board solar panels. The plasma thruster was successfully bench tested in 2009 and 2010. Both the final thruster prototype and the test lab are expected to be complete by 2013, and a full scale test flight is being scheduled by the end of 2014. After that: Mars.